In terms of urban planning the Dorotheen Quartier presented the unique opportunity to upgrade what many hitherto had considered to be the back of the Breuninger department store: the exit of the Karlspassage shopping arcade at the “far end” and the building’s façade towards the Sporerstrasse. The scheme joins up the two points of entrance at the rear of the store – one at the arcade and another one at Breuninger Markt – by adding single-storied extension buildings, and create two clearly defined and vibrant urban plazas. The Sporerstrasse widens at this point and expands even more across the Münzstrasse into the broad area in front of the covered market hall. From here it continues as a popular and lively urban space. Different plazas are articulated thanks to its different topographic heights: The “Sporerplatz” in front of the covered market and the much higher plaza “Dorotheenplatz” in front of the Karlspassage arcade. 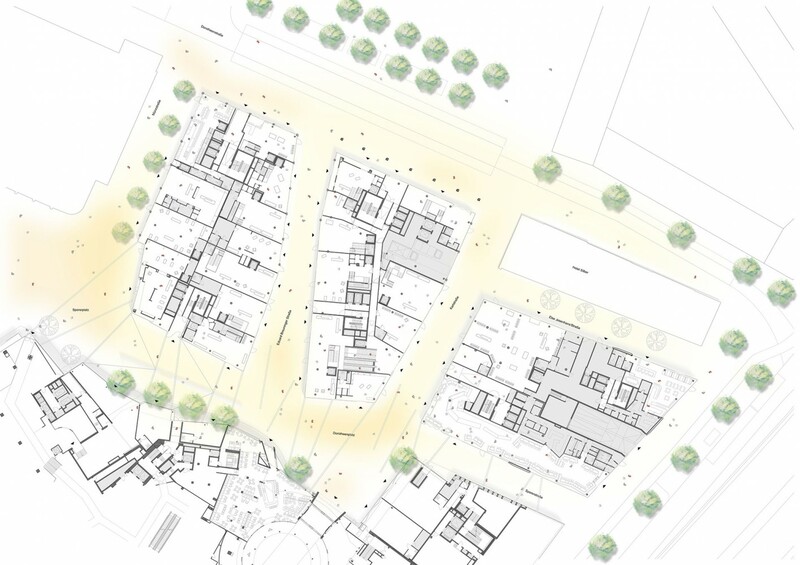 The use of the same paving slabs connects these areas, not just visually but also spatially. Imagine that these spaces are united as if underneath a large green canopy: above they are defined by the clear-cut contours of the roof surfaces that are staggered backwards, reaching ever higher towards the top. Below they give shape to the streetscape. The ensemble of extensions slips easily into this urban, organic context and integrates the existing entrances. The choice of materials and also the striking design provides new architectural accents. Attractive and premium retail as well as restaurants, which can all be accessed from Sporerstrasse, add to the vibrancy of this pedestrian link and thereby upgrade a street that in the past had merely lined the back of a building. 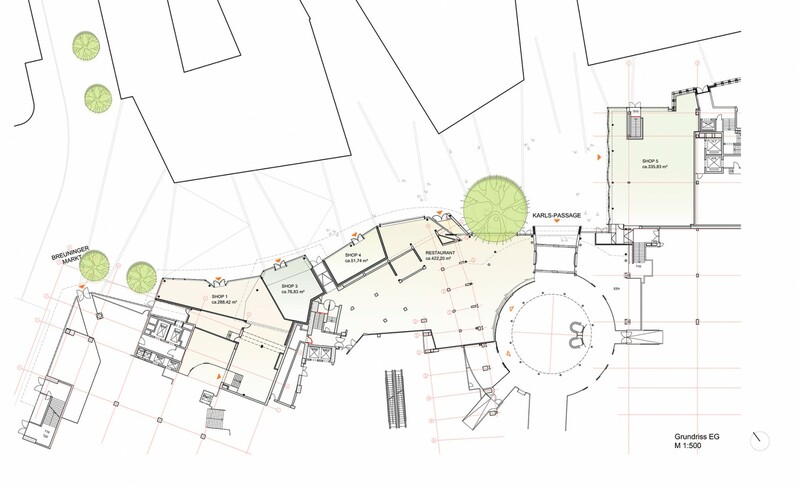 The catering space in the arcade is linked to the outdoor seating of restaurants or cafes at the Dorotheenplatz and acts as a fixture; in the future perhaps also for the Bohnenviertel district across the big road which might become more directly connected one day to the inner city. Linked to the busy web of pedestrian zones in Stuttgart by a new strip of diversions, this prime city site presents ample opportunities for shopping and stopping by at leisure, while at the same time strengthening the cross connections of the urban fabric.